The problem with cutely-themed cookbooks is that sometimes the cuteness is what sells the book, and the recipes are less than stellar. 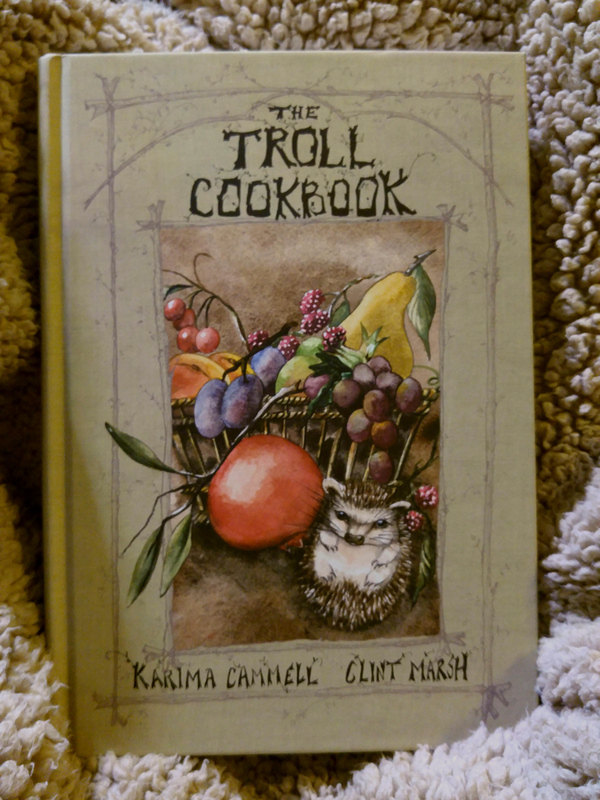 But still, I couldn't help requesting The Troll Cookbook. To be completely honest, I didn't know if this was a book about cooking for trolls, cooking trolls, or for trolls who are cooks. It's actually two of those three. No trolls were eaten. The recipes were solid. Eclectic. Something for everyone. But let's face it, the troll theme is why people would buy this book, so let me give you a few examples of things that made me giggle. The introduction to the Sweet Rice Dumplings says, "If the cook you've kidnapped has escaped, make your own dumplings by following this recipe." Okay, before the recipe there was a charming story about someone who was kidnapped by trolls and who cooked for them. But just I saw the introduction first and then went back and read the story. The introduction to gnocchi says, "The trolls use their thick fingernails to press patterns into the hearty, dumpling-like gnocchi they make. The technique sometimes lends the finished pasta a peculiar flavor." I guess the moral is that you shouldn't let trolls make gnocchi for you. In a section about shopping, it explains how trolls are confused about our modern supermarkets: "Moving beyond the produce section, the troll is equally frustrated with much of the rest of the supermarket, with its aisles of packages plastered with photographs of the food inside, or worse, of happy people. Trolls appreciate truth in advertising. Not once has a troll torn open a box of cereal and found actual people to eat inside. It's disappointing." As far as recipes, you'll find instructions on making cottage cheese. paella, flavored salts, soups and salads, chili, jams, deviled eggs, and plenty more. There's information about pickling and preserving, making sausage, and even instructions for making vinegar. The book is arranged by season, which makes sense for recipes that use fruits and vegetables, but seasonal doesn't make sense for things like yogurt, so it might take some browsing before you realize what you can make from this book. On the other hand, the pictures are fun and the text is amusing. So it's definitely worth a browse. I received this book from the publisher in order to review it.